So things happen this way. 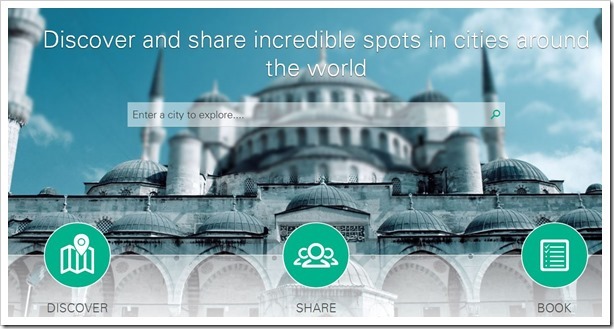 You sign up, create boards or itineraries for places you visited. You can also create a uniquely themed map for the city you reside. If you are travelling to a place for the first time or want to know more about it to explore, you can search for boards and itineraries created and shared by people living there or experts. At the same time, you can also have friends who you can follow to keep a watch on their recommendations. The web app looks very decent and fun to browse around, however I had trouble adding itineraries twice, before I succeeded third time. The company was founded by two grads from IIT Delhi and Harvard both who met met during their stint as consultants at the The Parthenon Group. Ravijot Chugh and Jen Blumberg both have immense wanderlust and have visited more than 40 countries across the world. The idea of 36hrs was first incepted by Ravi while planning for a trip in Singapore when he had to use Google Spreadsheet and docs to collect all the travel interests in the place. While working at the Parthenon Group’s office, Ravi shared the idea with Jen, who were also looking to startup a business, agreed instantly. Both believed technology and social media has a lot to contribute in travel sector.Apart from Ravi and Jen Amit Mondal and Manpreet Khurana are responsible for front end and back end of 36hrs. Before their idea could be made into a product, it was adopted by the Startup Chile accelerator program. The travel startup’s first funding came from this programme which offered them $30,000 as seed capital. They have been bootstrapping their business and plans to raise funds in the next few months. Valued at $100 billion, the travel activity market is surely a lot to benefit from. A survey suggests most travellers are influenced by online testimonials. 36hrs has seen more than 1000 signups in just two weeks after its initial launch a month back. People from India and South East Asia among the most engaged ones among those. Do give 36hrs.in a spin and let us know what you feel about this latest entrant in online travel discovery space!